Ever wonder how leaves change colors, flowers bloom, and ladybugs get their dots? All these nature-related wonders are the work of fairies! Every fairy in Pixie Hollow has a special talent. But Tinker Bell isn’t so sure she’s happy with hers. Sure, using her special tinkering hammer to create her contraptions is fun, but she’d rather travel to the mainland to help with the change of seasons. 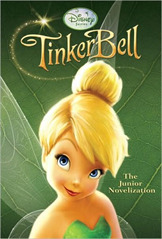 Based on the Tinker Bell direct-to-DVD movie, this junior novelization retells the whole wonderful story of Tinker Bell’s realization that everyone has something important to contribute—even a tinker fairy! Plus, there are eight pages of full-color images taken directly from the film. Your little Fairy loved the Tinker Bell movie. Now she was read the story to herself. Or to you. Because Tinker Bell is that special.